A large, energetic crowd of around 1000 came out to protest Bill C-51, the so-called “anti-terrorism” bill that will virtually bring the secret police and wide suppression of peaceful protest to Canada. 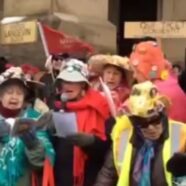 The Raging Grannies were there to sing about the bill and were asked to sing it again. Check out the video and check out the words.